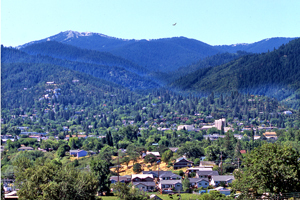 Ashland is a little green oasis that sparkles like an emerald at the base of the snow-capped Siskiyou Mountains. 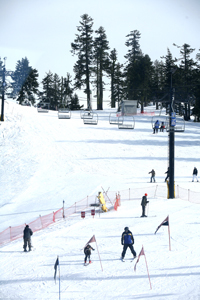 Mount Ashland (ele. 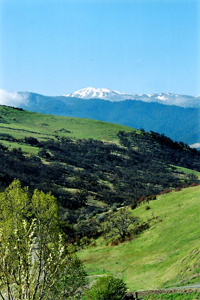 7,500') looks down on the long narrow corridor called the Rogue Valley, with its meandering rivers, blossoming pear orchards, and rolling hills. After the slow climb to the summit from the California side, impatient drivers either race down or slide down the mountain (depending on the season) to the valley floor, where they can take 1 of 3 exits into our small but linear town (1 mi. wide & 5 mi. long). Ashland (pop. 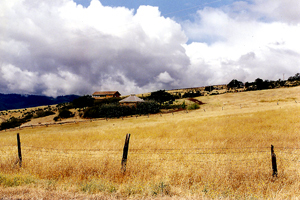 20,000) lies at the southernmost tip of the valley, only 15 miles north of the California border. 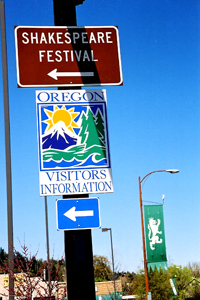 Go another 15 miles north and you'll be in Medford, Oregon (pop. 65,000). 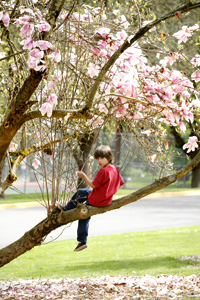 Beyond Medford is Grants Pass, then Roseburg, Corvallis, Eugene, Salem, and Portland. That pretty much sums up the state from Interstate 5. Somehow Ashland ended up a comfortable 300 miles from everywhere: 300 mi. from Reno, 300 mi. from San Francisco, 300 mi. from Sacramento, 300 mi. from Portland. That's good. We love our neighbors...just not too close! 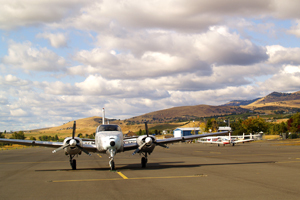 If we want to travel to where the action is, we can get on a plane at the International-Medford Airport. 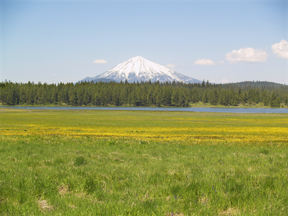 Klamath Falls is an hour to the east on Hwy. 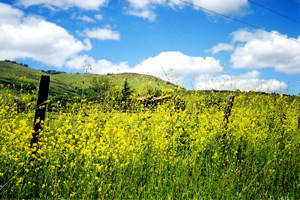 66, a winding road with breathtaking views; the ocean beaches are two hours to the west, on the scenic Redwood Highway. 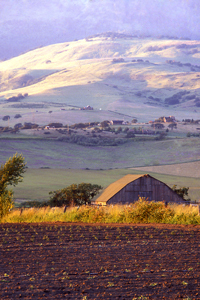 It was love at first sight when I drove into Ashland 25 years ago, shopping for a small cultural town, and I've been entranced ever since with its irresistible beauty and charm. Sunset magazine had named it as one of the best small towns in the US, and I was checking it out. 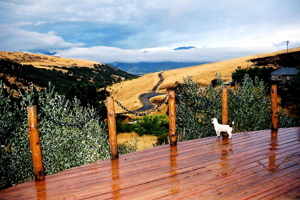 At 2,000' above sea level, Ashland proper is spread out along a main boulevard, surrounded by wooded hills on the west, and rolling hills on the east. Houses sprinkle the steep hills all around and at night look like fairy lights on a riviera. The foothills that lead up to Grizzly Peak on the east are a sight to behold. The play of light and shadow on those hills is a year-round panoramic feast for the eyes, as colors change with the time of day and the season. In art and photography it's called chiaroscuro...a quality strived for by the renaissance masters, but an everyday gorgeous view from Ashland. There are four distinct seasons here: sunny, rainy, foggy, and snowy. The weather is fairly mild, though, with average temperatures ranging from 30 to 90 degrees. 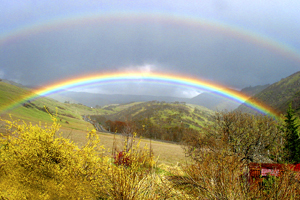 Spring brings fleecy white clouds and rainbows. 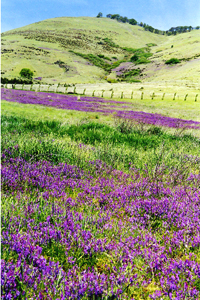 Summer comes on fast, hot, and dry, making the lush fields of purple lupine and vetch disappear almost overnight. Fall falls in the form of rain (20"/yr. 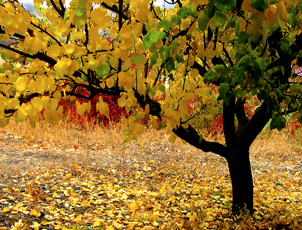 ), but the fall colors in Ashland rival the Northeast for brilliance and variety. 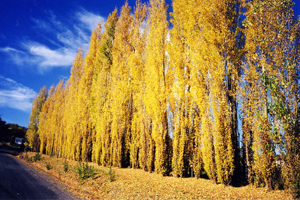 Autumn here is spectacular. Winter is off-again-on-again cold, with very little snowfall on the valley floor... just enough to make at least one snowman with the kids. Every year there is a week or two of thick fog that settles in like an unwanted guest who stays too long. We have a growing season of 170 days (USDA Zone 7), which is excellent for gardening and especially conducive to growing roses. 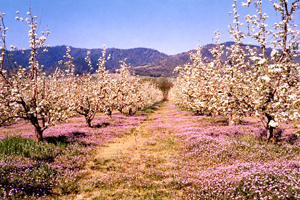 Southern Oregon has always been pear country. 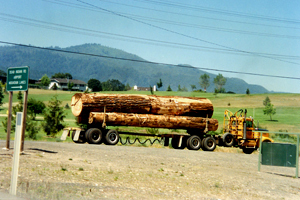 My former boyfriend Kirt Meyer, who helped me build and rebuild my log home, was born and raised at the Meyer Orchards in Talent, Oregon (5 miles from Ashland). The Meyers have three great kids; pears weren't their only crop! 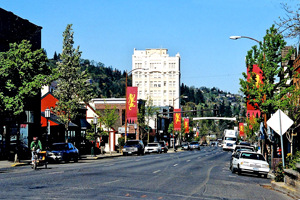 Downtown Ashland was actually planned, and designed to be people-friendly. It has a central hub, called the plaza, with the hubcap being an area to sit, chat, and taste, if you so desire, the stinky lithium water (a famous elixer) from the fountain. A tourist-information kiosk is nearby to make sure you are properly welcomed and don't miss seeing everything the town has to offer. 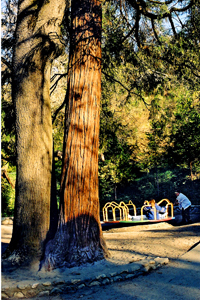 The plaza, lined with historic buildings and buzzing with quaint shops and small cafes, serves as the gateway to Lithia Park (aptly named)...a 100-acre paradise of ancient trees, a sycamore grove, a Japanese garden, well-kept expanses of lawn, 2 ponds with ducks and swans, tennis courts, and a kiddie playground, just to list a few of the amenities. 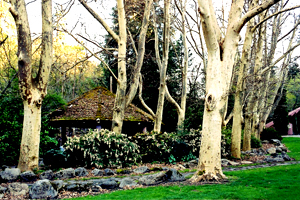 Lithia Park, established in 1908, is so enchanting there is no description in words that can do it justice; you have to experience it first-hand to believe the palpable and emotional effect it will have on your senses. 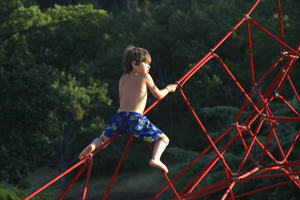 Ashland Creek runs through the park, cascading over huge granite boulders and providing pools for kids to splash around in. 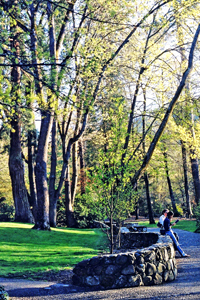 You can hear a lot of squealing with delight in Lithia Park, not to mention birds tweeting and baby ducks peeping. The creek is flanked on one side by jogging trails and on the other side by picnic tables, with every specie of shrub and flower imaginable filling in the spaces. Orchid-like rhododendron blossoms are so plentiful you might think you are in Hawaii. 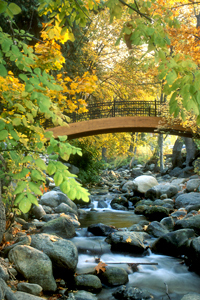 Handsome curved bridges straddle the babbling brook so you can leisurely stroll through the park European-style. Just thinking about the setting, I can hear the mandolins serenading a kissing couple. 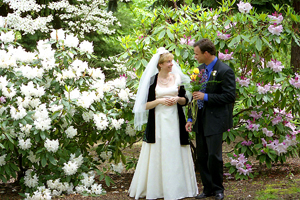 You can even get married in the park. 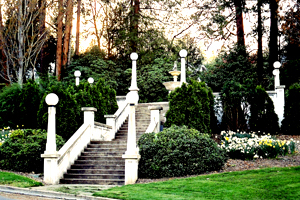 There's a special elegant setting with white steps leading up to stately columns surrounding a fountain full of coins tossed in for wishes. 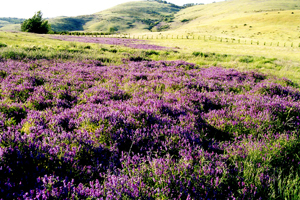 Ashland would be a wonderful place to spend a honeymoon! The park has a band shell for summer performances of our exceptional city band and Ballet in the Park (put on by the Oregon State Ballet). 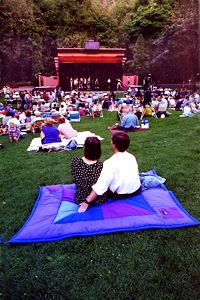 Locals and tourists alike sit on the beautiful grassy slopes and socialize while enjoying free entertainment in July and August. 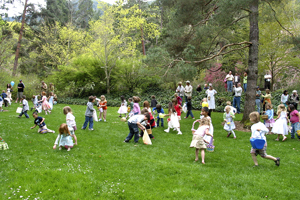 Free-spirited children dance to the music and provide a delightful distraction to the program. For winter fun, the park has an ice-skating rink and a skate-rental office where prices are nominal. There's a large kiddie playground surrounded by lawns to put blankets on and launch the kids from. As a spectator, you'll witness the rare phenomenon of a mother, and a father, and their kids all playing together as a nuclear family. Imagine that! 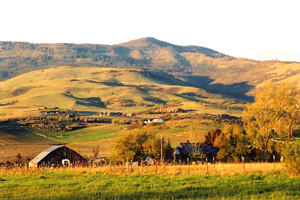 This is a family town, in the complete meaning of the word. Everywhere you look, you'll see parents walking together and pushing strollers, entire families holding up traffic while riding their bicycles, with the father in the lead like the Pied Piper and the kids following like ducks in a row, down to the youngest one on training wheels. 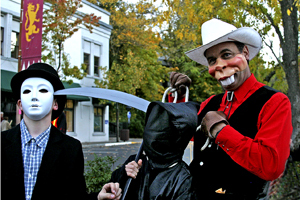 Driving around the neighborhoods in Ashland can be quite an entertaining experience to the discerning eye. You'll see nostalgic sights like old-fashioned lemonade stands tended by kids with freckles and missing front teeth selling warm, unidentifiable liquids, and little kids playing pretend dress-up on the sidewalks. You'll also see pretty teenagers playing for-real dress-up on the sidewalks, nearly causing whiplash incidents! 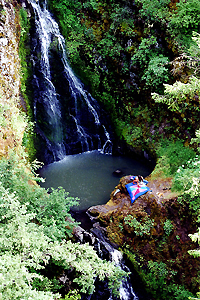 As if Lithia Park isn't enough outdoor recreation room for a town of only 20,000, Ashland has several more parks, one of which has a fountain-spray area for kids to cool off in, and the other has a public pool. There is a YMCA with an olympic-sized pool, and the university has a pool as well. 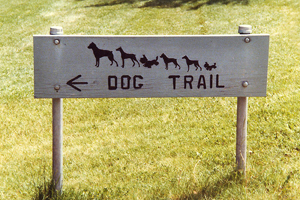 No dogs are allowed in the public parks, but there's a special dog park, where dogs and their people can run around and socialize. It's a lively and popular place. There is no shortage here of baseball and football fields, running tracks, and tennis courts. 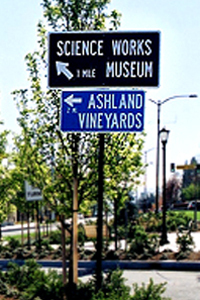 Ashland has two post offices (1 main, 1 substation), two fire stations (one on each end of town), 2 fitness centers, an impressive public library, a hands-on science museum, a fish and wildlife forensic lab (the only one in the world), a major art museum, and 30 art galleries. To top it all off, it has a warm and wonderful hospital, with a special birthing center. This is the little tourist town that could, and did! It supports 45 B&B's (bed & breakfasts); 42 churches and 3 synagoges; 95 restaurants, cafes, and other eateries; bars galore; 12 coffee houses; 25 motels and hotels; a dozen barbers; and 75 beauty salons (and there's still more than enough hair to go around!). We even have our own phone book, featuring any local photographer who wants to compete for the annual cover photo. In Ashland we have a tight communal bond, but we're quick to reward individuals and their contributions. The Sneak Preview, a local weekly newsletter, publishes annually a special issue called "The Best of Ashland" that acknowledges superior performances by businesses and individuals who serve the community. Patrons' votes are tallied (the towns-people) and everyone strives to get mentioned in that issue. The Daily Tidings, Ashland's own newspaper, features a weekly supplement called "The Revels" that lists all the entertainment going on in the area. There is an outstanding and friendly senior center and several assisted-living facilities, as well as transportation for seniors who don't drive. A public transit system runs from dawn to dusk for anyone who chooses to ride a bus around Ashland, or to Medford and back. 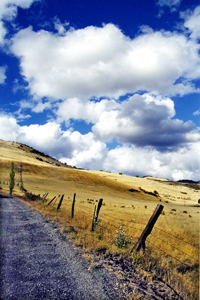 Time magazine listed Ashland as one of the top 10 retirement destinations in the US (1999). The university hosts a large Elderhostel program offering a wide variety of educational programs open to people 55 and over. 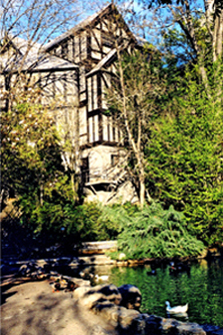 Ashland is the home of the Shakespearean Festival, which made its debut in 1935 and has been going strong ever since. 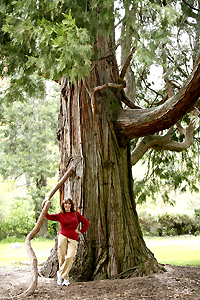 A half-million tourists visit Ashland every year. 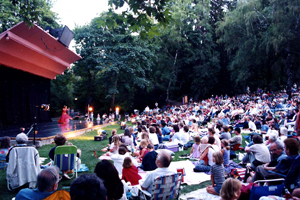 Shakespeare's plays are performed from February through October in three unique theatres...a 1200-seat outdoor Elizabethan stage, the 600-seat Angus Bowmer theater, and the 300-seat New Theatre (formerly the Black Swan). Another venue, the Oregon Cabaret Theatre, a beautiful renovated church with stained-glass windows and tiered seating, attracts almost a quarter million patrons to its 140-seat dinner theatre to watch musicals and comedies. Tourists spill over into Jacksonville, a nearby restored gold-rush town, where they can attend the "Concert Under the Stars" at the Britt Festival. Peter Britt hosts performances from famous national and international musicians in every genre of music. 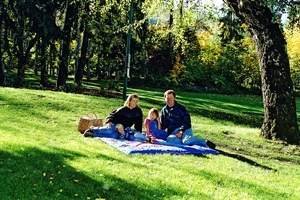 The Britt Gardens are beautifully landscaped grounds where you can sit on the lawn and enjoy a picnic while being entertained from the outdoor stage. If you tire of wonderful live performances and want to see the latest Hollywood blockbuster instead, Ashland has two movie theatres, one on each end of town. All summer long on weekends there is a colorful crafts fair going on featuring local artisans and street musicians. It runs along a walkway parallel to the creek, where you can saunter and browse and partake of the wares, or you can just meet up with people and socialize. To encourage bicycling and facilitate getting from one end of our long town to another, the city created a bicycle path (sidewalk) that runs alongside the main boulevard (Siskiyou Blvd.) all the way into town. 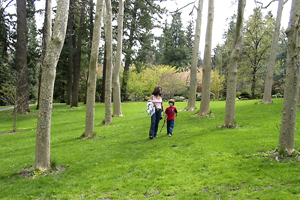 It passes in front of the beautiful university that covers several blocks and fills 175 acres. 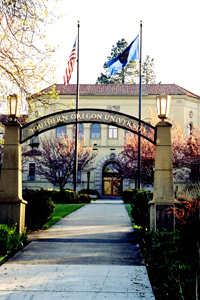 Southern Oregon University (SOU) has been around since 1882 (first called a college, but recently changed to a university). About 6,000 students attend our liberal-arts and sciences university and school of business. As you might expect, it is a gorgeous campus replete with imposing historic buildings, a spectacular library, and an impressive recital hall. Ahhh, the recital hall! Ashlanders love classical music. The university has a music department it can boast about, particularly its illustrious piano professor and world-class pianist, Alexander Tutunov, from Russia. We're lucky to have such a biggie in our tiny (town). 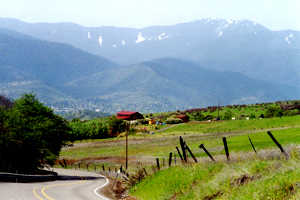 That's the beauty of Ashland..... it is such a desirable place to live that it attracts desirable and talented people. Many famous actors, writers, and artists are tucked away in their second homes here, where they R&R before going back to the big city. Bill Phillips, a famous aviation artist featured in the Smithsonian Institute Gallery, lives here year-round and is the nicest regular guy you'd ever want to meet. The median family income here is about $50,000. An upscale sizable home costs between $300,000 and $500,000, with smaller tract homes going for $150,000 to $200,000. The median rent for a house is $800/mo. ; an apartment, $400/mo. Property taxes are high because we have no state sales tax, but we refuse to vote in a sales tax. Oregonians are smart; we've learned that taxes never go down, even if new ones are introduced with promises and promises to reduce the old. However, the city of Ashland itself dreamed up a special tax to help fund improvements in parks and recreation. When you eat out, a 5% meal's tax is added to your bill. Surprise, surprise. 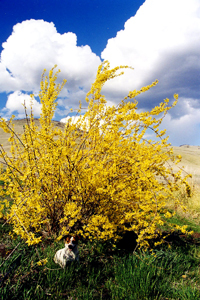 Ashland stimulates the senses, inspires the imagination, and enlarges the spirit. People have chosen to live here (not come here as victims of circumstance) and they are happy to be here. The optimism is contagious, and courtesy abounds. A large percentage of the population is well-educated, cultured, and industrious. The median age is 40. People are enlightened and sophisticated. Conservation and recycling are big, as is a healthy lifestyle. 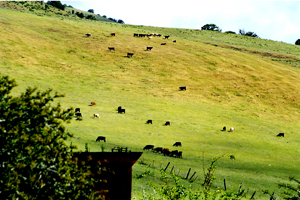 There is a natural-food co-op for an unrefined diet, and a grange co-op if you want even more roughage! Massage and yoga are a given. You can sit at Starbucks downtown and watch the daily parade go by or go out at night on a treasure hunt to the local nightclubs. As in most cities, the partygoers come out in droves on weekends, when the bars stay open until 2 AM. Almost all the other businesses, though, roll up the sidewalks at 8 or 9 PM. (We don't even have a 24-hour cafe!) 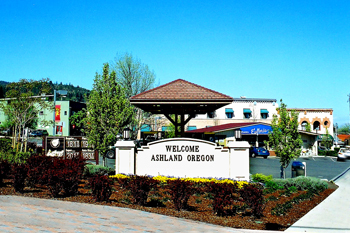 Ashland is what's called a bedroom community, but not in the illicit meaning of the word. In fact, although this town is big enough to philander in, it's small enough to get caught in! 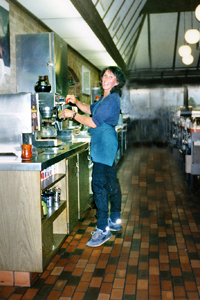 I know, because I was a waitress here for 20 years, and I knew everybody's business, and everybody knew mine! 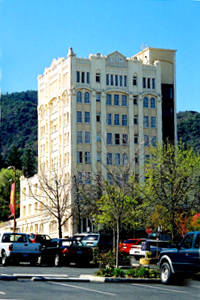 The Ashland Springs Hotel downtown (formerly the Mark Antony) is a 9-story, 70-room historic monument built in 1925. The hotel has recently been renovated into a lush and plush hotel/bar/nightclub combo "where it all happens." There are several other hot-spots in Ashland, but you have to ask around to keep up on the latest bar scene. The Windmill Inn on the south end of town is a beautifully landscaped motel complex with facilities to host seminars and other big events. The town is sparkling clean and constantly being beautified. Business signs of any kind have to sit low and unobtrusively and look classy, not gaudy; it's the law. Traffic is not a big problem in Ashland, except for the continual upgrading of the streets, like the recent work we endured when the city installed and landscaped center-dividers along our main boulevards. We locals get irritated, but the result is always so nice that we should be ashamed of ourselves for complaining about something as inconsequential as a five-minute delay in traffic in trade for permanent shade trees and flowering shrubs. We're spoiled. 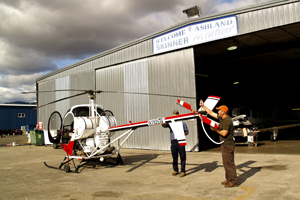 Driving in Ashland is a breeze...you can be anywhere you want to go in 10 minutes. Motorists seem to be awake and aware, probably because they know they're being monitored by the local cops, who keep an eagle eye out for even the smallest infraction. 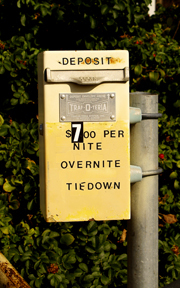 There are no parking meters, but if you overstay your limit in a time zone you will get a ticket. If you fail to stop for pedestrians, you will be drawn and quartered. The police are strict because they have to protect not only the locals, but the huge influx of tourists as well. We have a reputation for a low crime rate, so people feel safe here, and we want to keep it that way. Although we've had very little crime in the past, it is increasing, along with the mass exodus from other states. Everybody loves to be on the receiving end of old-fashioned, small-town values and manners, but newcomers tend to bring their big-city attitude with them, which can manifest into rude behavior. It's rubbing off on some of us who are in the service industry and have to smile for a living, but we're trying not to become jaded. Our population has slightly overgrown the critical-mass limit of 20,000 that makes it hard to remain a nice small town. A bumper sticker I spotted on a teenager's car last summer reflects my concern, though I couldn't help but laugh. It read: "Tourists Go Home, but Leave Your Daughters!" It's certainly an energetic city...maybe because of all the coffee shops! You could drink coffee for a living here, and some people do! 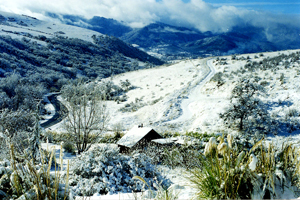 But if wine-tasting is your favorite pastime, there are two splendid vineyards and wineries in Ashland...and our own micro-brewery. A person can stroll around this charming village all day, not spend a cent, and still have a marvelous time. There are new-book stores, used-book stores, small cafes, ice-cream parlors, bakeries, confectionaries, and flower shops. Rows of artistically decorated boutiques that tempt window shoppers with eye-candy line both sides of the main street. They display a wide variety of the latest styles in clothing, jewelry, lingerie, souvenirs, and anything else you might impulsively decide you can't live without. The locals are a little frugal, but the tourists spend money...lots of money. 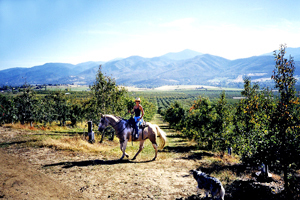 Tourism has the greatest impact on our economy, followed by agriculture (orchards) and logging. People are friendly and cheerful, nice dogs await their masters outside shops and restaurants, and there's a general feeling of well-being and harmony in downtown Ashland. It gives one the sense of security that even with all the trouble going on in the world, things are OK after all, and life is good...at least for now...at least in Ashland. 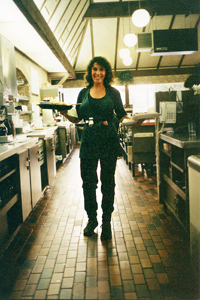 Ashland is a self-contained, full-service town but it has its share of self-service people. Carpenters, craftsmen, and inventors are plentiful. There are over 50 general construction contractors in town, including my former boyfriend Kirt Meyer and his partner Vadim Agakhanov (Home Renaissance). They helped me resurrect my log house out of the ashes when it burned down in 1995 and have been builders extraordinaire ever since. Ashland has its own lumber yard, several cabinet shops, and a great hardware store, where all the rugged, good-lookin' guys hang out, and their pickup trucks fill the parking lot. Besides Texas, Oregon has more trucks per capita than any other state! 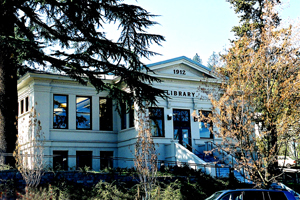 If you can't find some esoteric thing you're looking for in town, there's always Medford, only 20 minutes away. Instead of taking the freeway, you can cruise down the old Highway 99 (parallel to I-5), which has become the non-scenic but necessary industrial route, with car dealerships, mechanics' garages, equipment rental shops, and everything else people need but don't want to see within their city limits. Hwy. 99 runs through Talent (pop. 6,000) which is only 5 minutes from Ashland and where WalMart resides, then through Phoenix (pop. 5,000) which is almost a suburb of Medford. 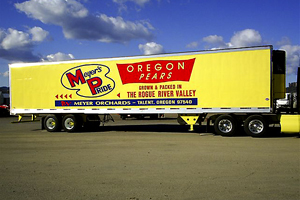 Phoenix is the home of the huge pear-packing plant, Bear Creek. I can't talk about Ashland without mentioning the railroad, because that's what put us on the map back in 1884 when the first train came through with mail, passengers, and freight. 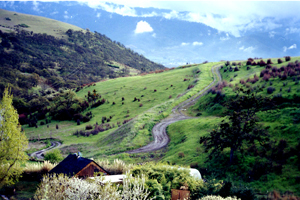 It took two engines to climb the steep track over the Siskiyou Mountains. The convergence of two railways ultimately connected Ashland to San Francisco and Portland. When the final links were built to complete the circuit across the US in 1887, were we connected to the national economy (not just to the west coast). Freight trains still rumble through Ashland's old Railroad District, which has been tastefully restored into a tourist attraction. Ashlanders are huge on holidays! Each event is a major celebration that involves the whole community. 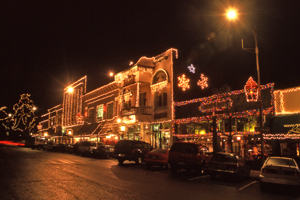 At Christmas, downtown Ashland looks like fairyland in a Walt Disney movie. Santa's Parade precedes the Festival of the Lights ceremony at which a million tiny lights go on with the touch of a wand. Halloween is another biggie that draws skeletons out of the closets from everywhere. People pour into town for the extreme fun. It starts with a children's parade of costumes and ends with the entire downtown area cordoned off so everyone can parade around and show themselves off. It's an exhibitionist's heaven and can get pretty wild, but downtown is patrolled by policemen, who step in only if they have to. The unique and creative costumes people come up with are amazing! It is the night to ham it up in the hamlet, and everybody does! The whole town closes down to celebrate the 4th of July. 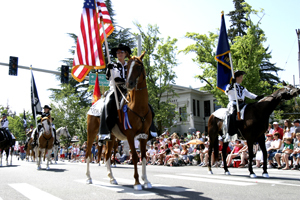 It begins with a 6-mile foot-race early in the morning, then a big long parade, then concessions in Lithia Park all day, ending with a spectacular fireworks display after dark. 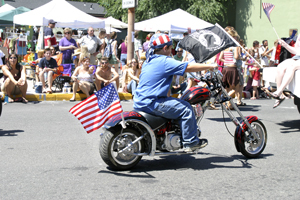 The city of Ashland doesn't skimp on the 4th of July! It's a day to get sunburned and drunk, and I think everybody achieves that goal! As in most towns, Ashland provides free meals for anyone who wants to partake on Easter and Thanksgiving. The rich and famous are welcome alongside the homeless and toothless, and it's fun for all. Mt. 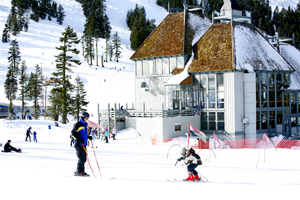 Ashland Ski Resort: Ski Nov. to April., 200 ski-able areas, 4 lifts, 23 trails, night skiing, rental shop, cafeteria, and bar. 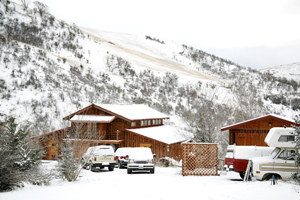 There are motel and restaurant accommodations nearby at Callahan's Lodge. 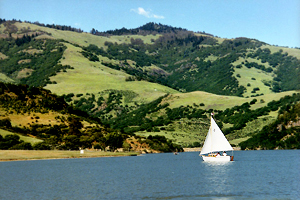 Emigrant Lake: 5 miles SE of Ashland on Hwy. 66. 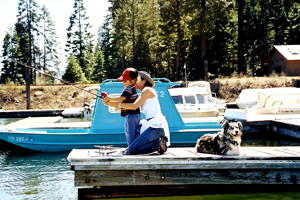 Swimming, boating, sunbathing, camping, fishing, and a giant waterslide for kids. 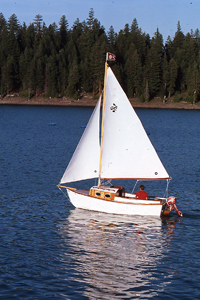 Several mountain lakes with resorts: Howard Prairie, Hyatt Lake, and Lake of the Woods. 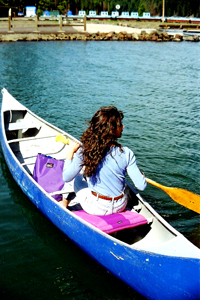 Fishing, boating, sailing, camping. Howard Prairie, only 20 miles up Dead Indian Memorial Rd. 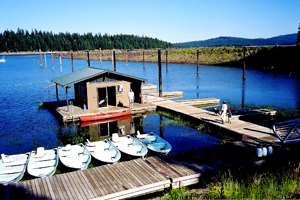 from Ashland, has a beautiful marina, a restaurant, boat rentals, slip rentals, and a place to clean your fish. 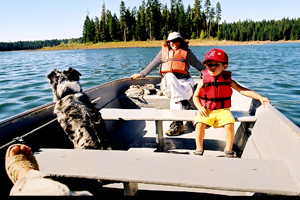 White water rafting and kayaking on the Rogue River: Guide headquarters located in the plaza in Ashland. Golfing: Ashland has its own grand and graceful golf course (9-hole 36-par) with driving range, golf shop, and restaurant. Airport: Want to learn to fly? Or already know how? 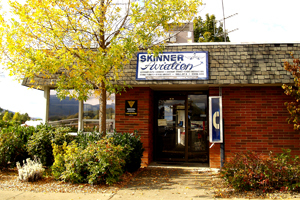 Ashland has its own adorable little airport that looks like the one on the children's TV program Jay-Jay the Jet Plane. 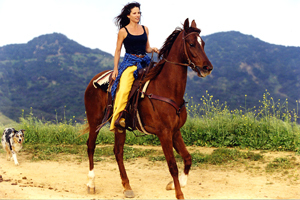 Horseback riding: All over the place. Shooting Range: We have it. Mountain climbing: Pompadour Bluff, Pilot Rock, Mt. McLoughlin (ele. 9,500')...all within 10 miles of Ashland. Cross-country skiing and snowmobiling...areas everywhere. Hot Springs: Jackson Wellsprings...with its private natural mineral baths, large communal pool, and campground, is just a mile north of the city limits. 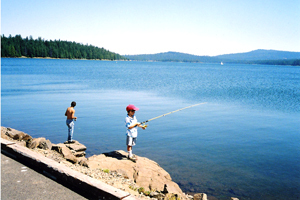 RV parks are on both ends of town. Garage sales: Ashland is the garage-saling capital of the world! Wow! I'd forgotten what a fantastic place I live in. Writing this article has re-opened my eyes to everything I've been taking for granted for 24 years. Sunset magazine summed it up best by saying, "The town itself is the main attraction." 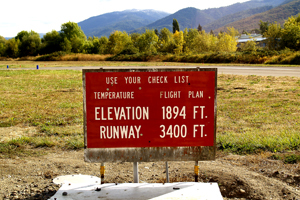 Elevation at airport - 1894 ft.
Bill Bryson, author of The Lost Continent, a hilarious account of traveling across the US in search of the perfect small town he named Amalgam, never found it...but that's because he missed Ashland. The secret is out! When the stampede begins, I may regret writing this article! Footnote: I did some basic general research for this article, but it is not intended to be a technical travel guide. My observations and conclusions are subjective. Statistics, mileage figures, and numbers are rounded off for ease in reading.